The number of discharges per test point is set to 10. This provides a very low number to capture windows of sensitivity. There are brief periods of time in which an EUT is much more sensitive to ESD. Those windows are usually caused by software activity. The influenced windows of opportunity and the required number of pulses to achieve a statistically stable result has been investigated by Bob Renninger and Habiger, and found its way into an ANSI ESD C63.16 standard. In brief the analysis says: one has to apply a much greater number of pulses to capture windows of opportunity. The exact number depends on the distribution of the sensitivity over time. The standard setting bodies, knowingly had to ignore these facts, as the members did not want to force every test lab to perform e.g., 100 discharges at each test point due to strain placed on the operator, especially in air discharge mode. However, for achieving a statistically stable result from a larger number of discharges is needed. Air discharge testing depends strongly on the length of the arc. The length of the arc can vary, for the same test point and voltage strongly. Those variations are partially from statistical nature, but also influenced by the way the approach is performed. At higher approach speeds (this is the intention of the standard setting body) the rise time will be on average lower and the peak values will be on average higher. The standard provides little insight into the expected speed of approach. Some test labs even drag the charged air discharge tip across the product (being in contact with the plastic surface) to see if a discharge occurs. This is a very risky practice, as this can lead to highly over-voltage ESDs having unrealistically low rise times. It is important to control the way of approach (straight to the point of expected discharge) and to control the angle the ESD generator is held, as this will influence the discharge current (weakly) but the coupling to the product strongly. If discharges that have much faster rise occur, there is no way for the operator to know in manual system level testing. The voltage is often set in large increments, like 2, 4, 8 kV and only pass or fail is reported. From a point of view of comparing test labs, it is important to know the failure level. For example, if one lab passes up to and including 8kV but the product would fail at 8.001 kV and if then is re-tested in another lab and fails at 8kV, then the uncertainty of the testing might only be 0.001 kV. Of course, the real uncertainties in ESD testing are much higher, but the example illustrates that we not only need a pass/fail but we need a failure level. This can only be found if voltages are increased in relatively small increments, maybe 1000V. The standard setting body did not want to require this as the strain placed on hand operators was considered to be too high. The testing for air discharge is usually done at 1 pulse a second. In theory one could test much faster, if one can (1) Remove the charge between discharges, (2) verify the function of the EUT (3) and one is able to move the ESD generator back to the discharge position. In a hand test this is difficult to achieve. However, in a robotic testing a faster rate can be achieved even in air discharge testing. Hand testing is limited in the number of ESDs applied, the levels tested at and the repletion rate. Robotic scanning does not know fatigue. One can apply a much greater number of pulses, to many more test points at much smaller increments to achieve a better, statistically more reliable test result. Robotic test results will cover a wide range of possible test results that might be achieved in other labs. The robotic testing can capture the discharge current for each discharge, knowing if a very fast rise time event occurred and correlated to an observed failure. Further, photos of the testing can be taken at each test point and each discharge (or the lack of discharge) is verified. The discharge current waveforms will allow to verify if e.g., the product is floating, if cables are attached, or if the product is grounded. A robotic test can be the “golden standard” and help in training of operators (e.g., show them the effect of speed of approach) or in disputes with other laboratories. 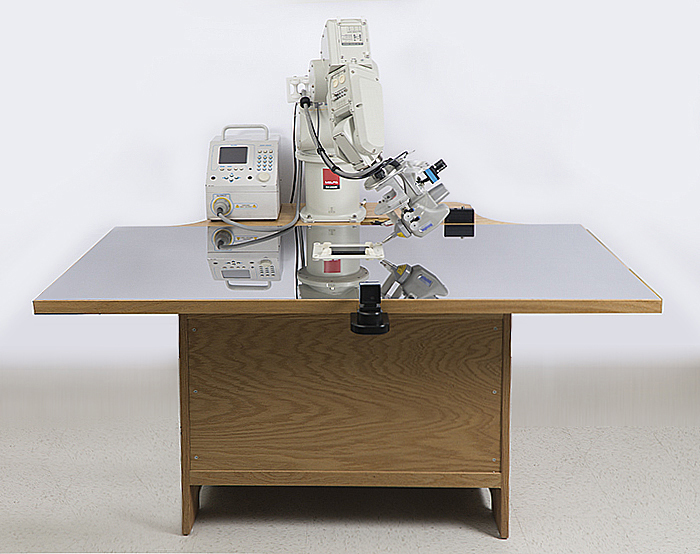 A robotic tester can perform other functions, like pressing knobs to reset a product, or be used for field matting and other immunity testing. If a suitable number of ESDs is applied to a product then robotic testing will offer a large test speed advantage. This will grow further if the number of test samples is larger than one.